Granola is one of those foods I have to come to appreciate just this past month. l would always hear of having it for breakfast or making your own and yet every time l tried it, l couldn’t figure out what the big deal was. My experiences with granola amounted to variations of dry toasted oat flakes with dried fruit (raisins always seemed to make the cut, much to my dismay) and seeds. Not very exciting at all. Not deserving of all the hype granola had claimed over the years from those around me. Oh, and the sweetness. It seemed any box of granola I picked up (natural, organic, or whatever variation you saw on cereal shelves) had the tendency to be cloyingly sweet. It was the grown-up version of sugary kids’ cereals, really no better than consuming a box of Frosted Flakes or Fruit Loop as far as the sugar content went. So for a very long time, I swore off granola. Why am I writing about granola? Well, it seems after some time now, granola has piqued my interest. I’m not even sure how it happened but I decided, one day, that I would make my own granola. Here I would have control over every ingredient and make it to my satisfaction, sweetness and all. This required a trip to the bulk food section of my parents’ store (yes, it’s like having a very well-stocked pantry on demand) and for some reason, the buckwheat caught my eye. And then it hit me. I like buckwheat. It’s nice and crunchy with a savoury flavour. I find it’s an under-appreciated grain and I think it needs to make a comeback. The first time I made this recipe, it was a handful of this, an approximate guess of that. After having run it through a very critical taste test group (aka Graham and Finley — well, Finley doesn’t count because she likes just about everything I give her), it was declared a success so I had to now figure out the measurements by making another batch. It took a couple iterations but I managed to get the recipe down pat. So without further ado, here is my Vanilla Maple Almond Buckwheat Granola (it’s a mouthful, but your mouth will be happy for it!). Just a note — all ingredients listed are raw, untoasted, and unsalted unless otherwise specified. I also chose to use organic ingredients where possible but that choice is entirely up to you. I also recommend you seek out the ingredients at your local bulk food store as it’s a good way to keep costs low, especially with all of the nuts and cherries involved. 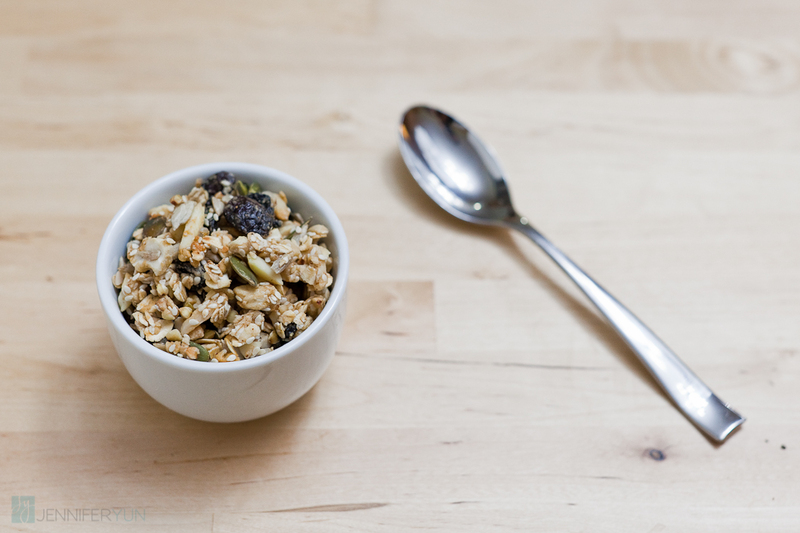 Recipe keynotes: A crunchy granola with a hint of lightly sweetened vanilla. Pairs great with a smidgen of thick, rich yogurt for a filling, healthy breakfast.